We can’t seem to get rid of Kim … and we don’t want to! Kim articled with bakerlaw and worked as an associate for us, then she moved away from Toronto, was away for a year and now she’s back at work as our senior associate. While she works remotely, she remains 100% committed to the bakerlaw team and clients! Kim attended Western Law where she enjoyed learning about human rights and international law issues. 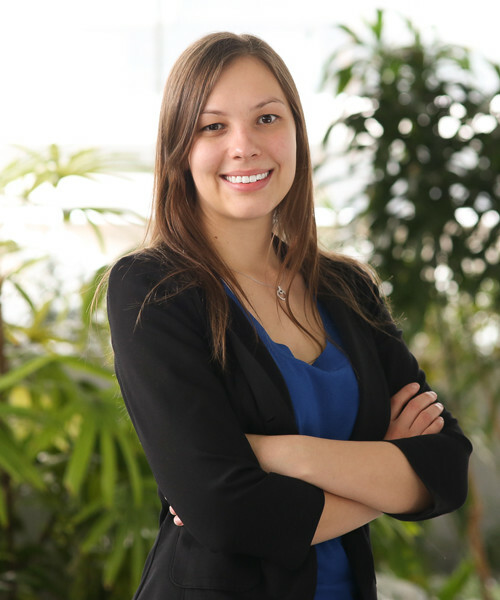 She participated in an internship at Canada’s Permanent Mission to the UN in Geneva, Switzerland. She also was part of the Jessup International Law Moot Team. As the researcher for the team, she helped the team to win the “Best Overall Memorials” prize for the national competition. Now Kim explores the challenges with domestic human rights legal issues while working here at bakerlaw. Kim has represented clients at the Human Rights Tribunal, Divisional Court and the Social Benefits Tribunal. Kim has also worked on researching and drafting submissions for all levels of court. Kim is often busy getting lost in the research relating to some of our biggest cases. She has acted on several education accommodation cases, some sexual harassment cases and plenty of disability accommodation files. Kim is passionate about the work we do and is committed to achieving the best outcome for our clients. She does venture away from her computer occasionally and during that time, she enjoys her spending time with her family, baking and exploring the great outdoors.